I have a few recipes for sandwich bread that I bake time and again, but sometimes I like to try something different. 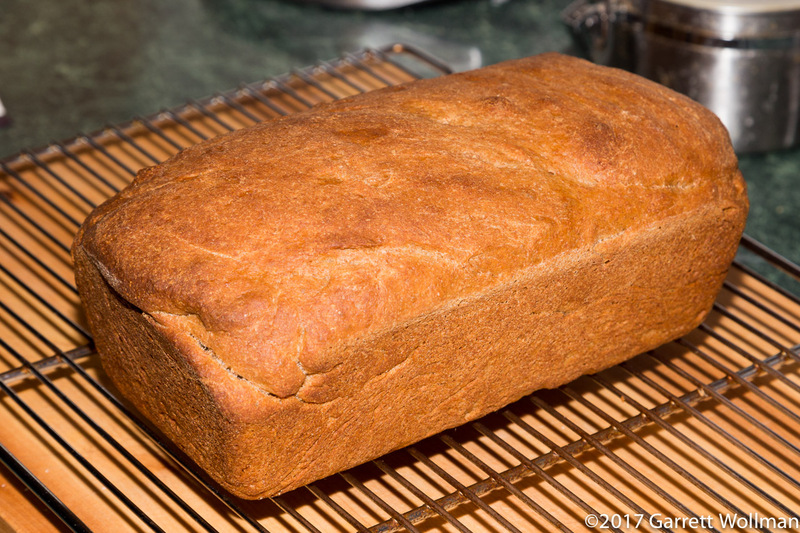 Last weekend, I stumbled across a recipe I had printed out from KingArthurFlour.com for an all-whole-wheat sandwich bread. The copyright date on the recipe is 2007, but I’m not sure when I actually first printed it out; so far as I know, I never made it back then. (It’s part of a collection of sandwich bread recipes that I printed some years ago when I was developing my own whole-wheat sandwich bread, but I didn’t keep very good records back then so I can’t be entirely sure. For the same reason, I don’t have the original URL where this recipe was posted.) 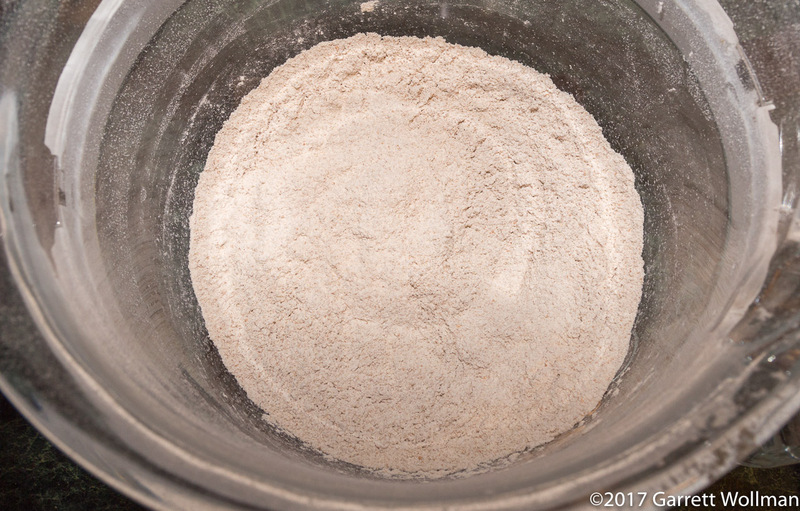 This formula makes a very wet dough, reminiscent of many “no-knead” recipes, and in fact I don’t think you could knead it without a stand mixer or bread machine, it’s so sticky. Like pretty much every homemade bread I’ve tried, the result is still denser than most commercially baked sandwich loaves, and thicker slices are inevitable unless you have access to a bakery slicing machine, but the crumb has a moist texture and a wheaty flavor, and the crust is appropriately soft for a traditional American sandwich bread. Even a week out of the oven, it’s still reasonably soft (thanks, I’m sure, to the significant quantity of oil incorporated in the dough). The assembly procedure is so simple I dispensed with the usual mise en place — just get out your mixing bowl, weigh out all the ingredients, and then stir. 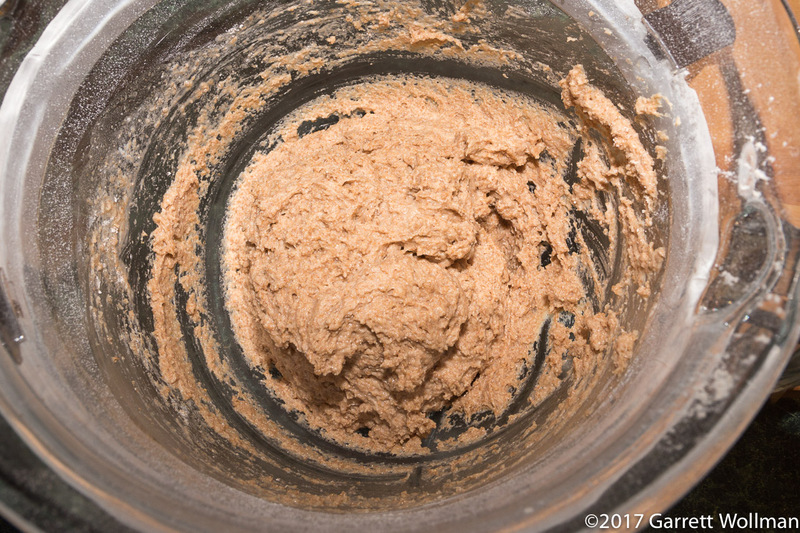 I put a little more effort into it than that, sifting and stirring together the dry ingredients before adding any of the wet. 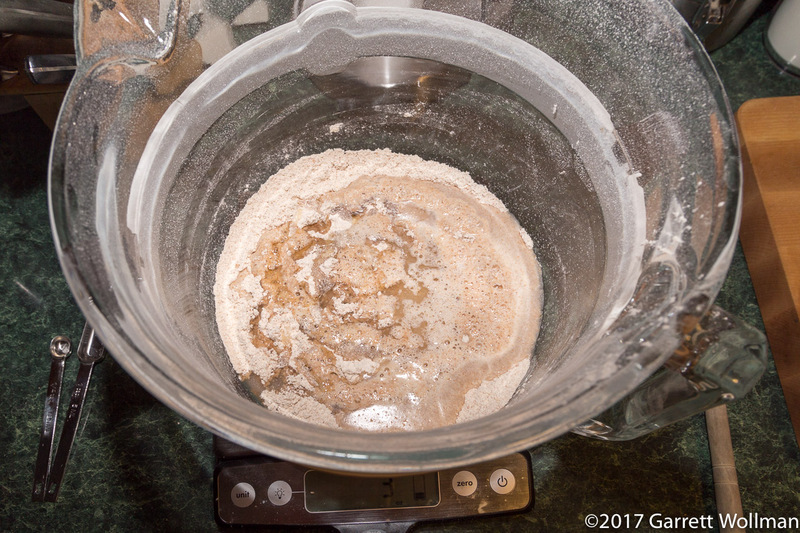 The dry team consists of 2½ tsp SAF Red instant yeast, 14 oz (400 g) King Arthur whole-wheat flour, 1 oz (30 g) nonfat dried milk (I used KAF’s “Baker’s Special” milk powder), and 1¼ tsp salt. 10½ oz (300 g) water, 1¾ oz (50 g) vegetable oil (I used sunflower oil, but any neutral-flavored oil would do just fine), and 3 oz (85 g) honey comprise the wet team. The recipe says that molasses or maple syrup could be used, in the same quantity, instead of honey; I wanted a more neutral flavor, although molasses is probably better yeast food. 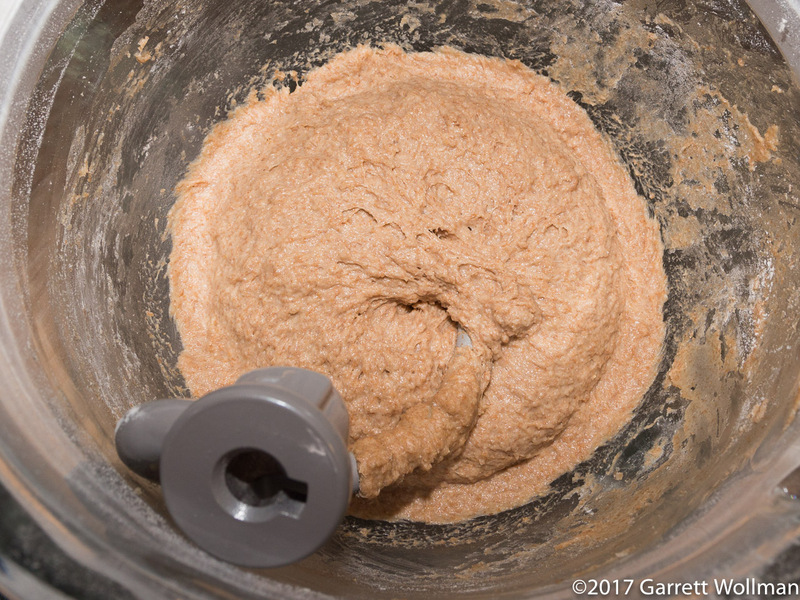 After stirring all of these ingredients together, the result is far more like a batter than a dough, very wet and sticky, and it’s unimaginable how you could possibly hand-knead it. The recipe calls for “6 to 8 minutes, or until it begins to become smooth and supple”, which was not really going to happen. 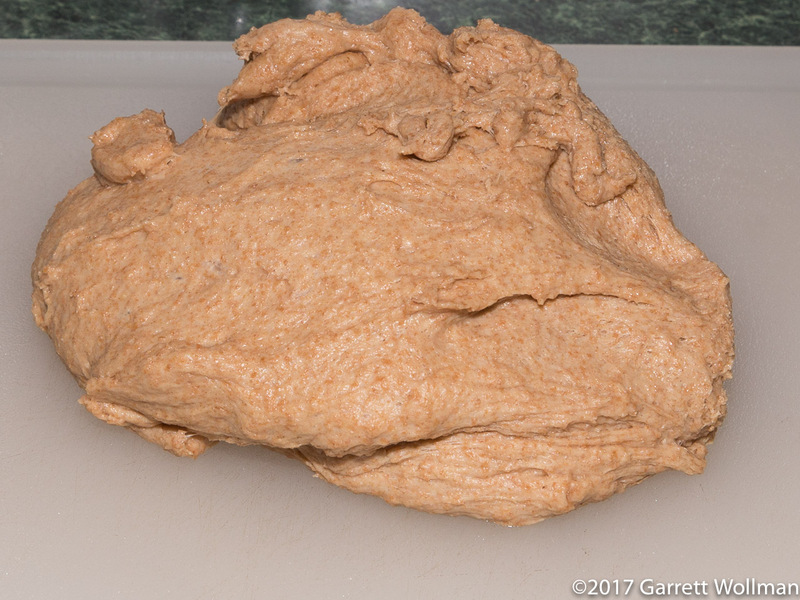 After ten minutes kneading in the stand mixer, the dough has come together somewhat, but you’d still be hard-pressed to think this had been “kneaded” by anyone’s usual standards. It’s possible that a 15-minute autolyse would have done as much good with less effort (and fewer dirty dishes). After kneading, the dough is transferred to an oiled bowl, covered, and allowed to rise for an hour or so. 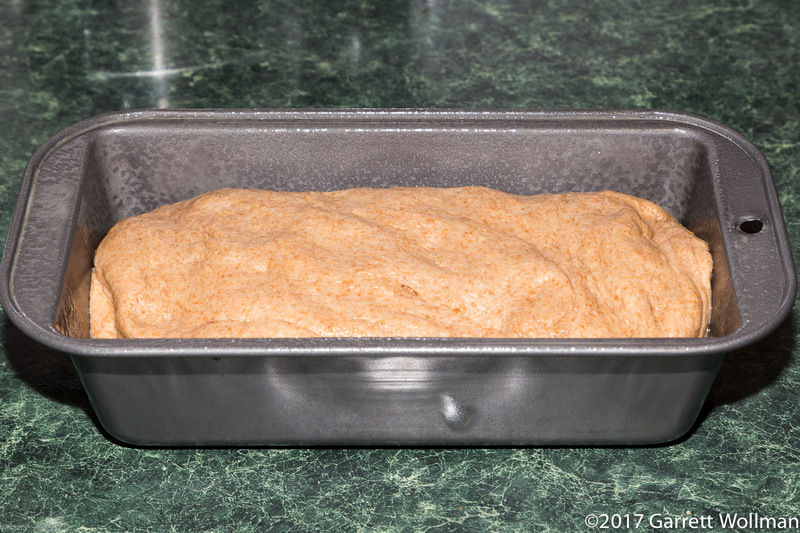 After the primary fermentation, the dough is turned out onto “a lightly oiled work surface” and shaped into an eight-inch-long blob, which is then dropped into an oiled 8½″×4½″ (215 mm × 115 mm) loaf pan for bench proofing. 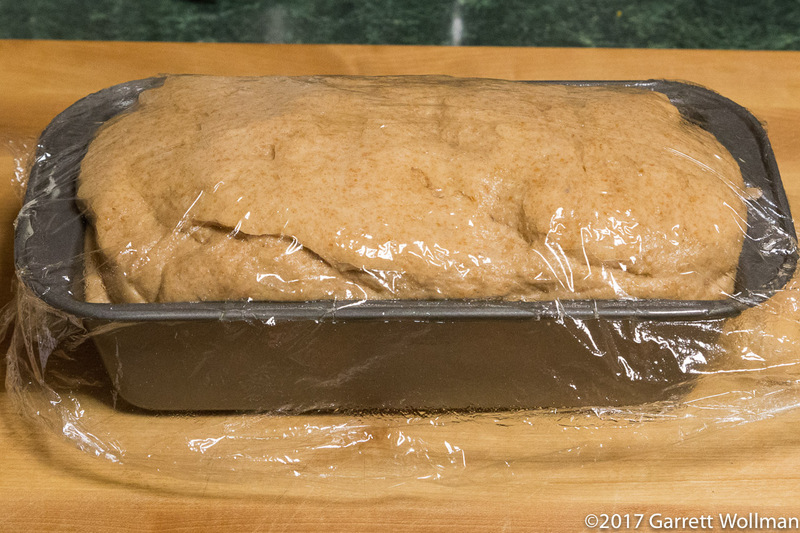 This size of loaf pan is fairly unusual for a sandwich loaf — most of the loaf breads I’ve done would use a 9×5 pan instead. Best to oil the plastic wrap before covering, as the dough is still pretty sticky at this point. Once the rising dough has crowned the top of the pan by about an inch, the bench proof is done and it’s time to bake. The usual temperature for this sort of bread is 350°F (175°C), and although the recipe says 40 minutes, it took 50 minutes total to reach the target internal temperature of 190°F (90°c). The loaf is tented with aluminum foil after the first 20 minutes of baking to prevent the top crust from drying and hardening too much. It take a couple of hours for the finished loaf to cool on a wire rack before it’s ready to slice. Let it cool for about five minutes in the loaf pan first, to allow the structure to start to set up, before removing it from the pan. Amazingly enough, I was able to get nearly even ½߱ slices out of this bread — perhaps my slicing skills have improved! — to end up with 16 slices or 8 sandwiches’ worth of bread, good for about two weeks if you freeze half. The texture of the crumb is excellent for an all-whole-wheat bread, with no large voids and a hearty yet moist chew. This bread is fairly calorie-dense, about double that of a supermarket whole-wheat bread. You could perhaps slice it a bit thinner, if you have a good slicer and a steady hand. It’s possible that baking it in a larger loaf pan, with additional time for bench proofing, would get a lighter crumb and therefore fewer calories per slice. The stated yield is 16 slices, which is what I’m going with below. 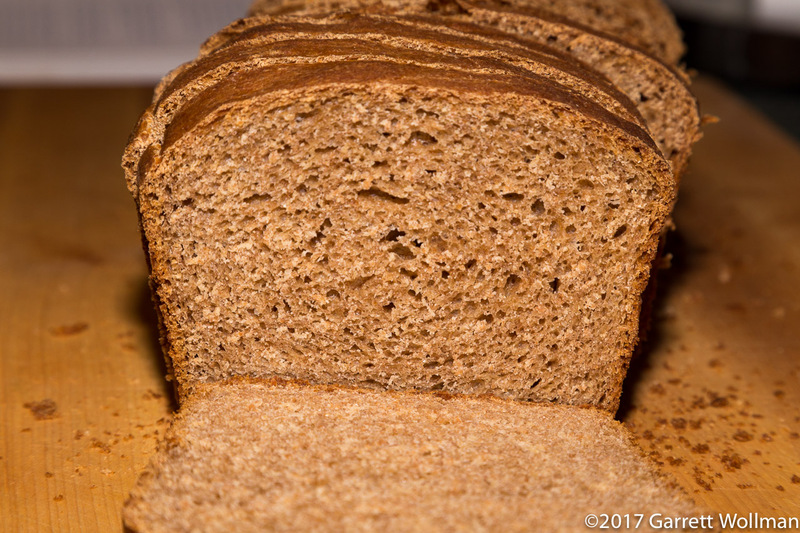 Gallery | This entry was posted in Food and tagged bread, King Arthur Flour, recipe, whole wheat. Bookmark the permalink.